I’ve been watching the Tour during July for fifteen years. It is many things, but it does not capture much about the discovery of cycling by thousands of people over a span of 125 years. I have a few of the prints of historic cycling posters left from my 40 years in the cycling industry. 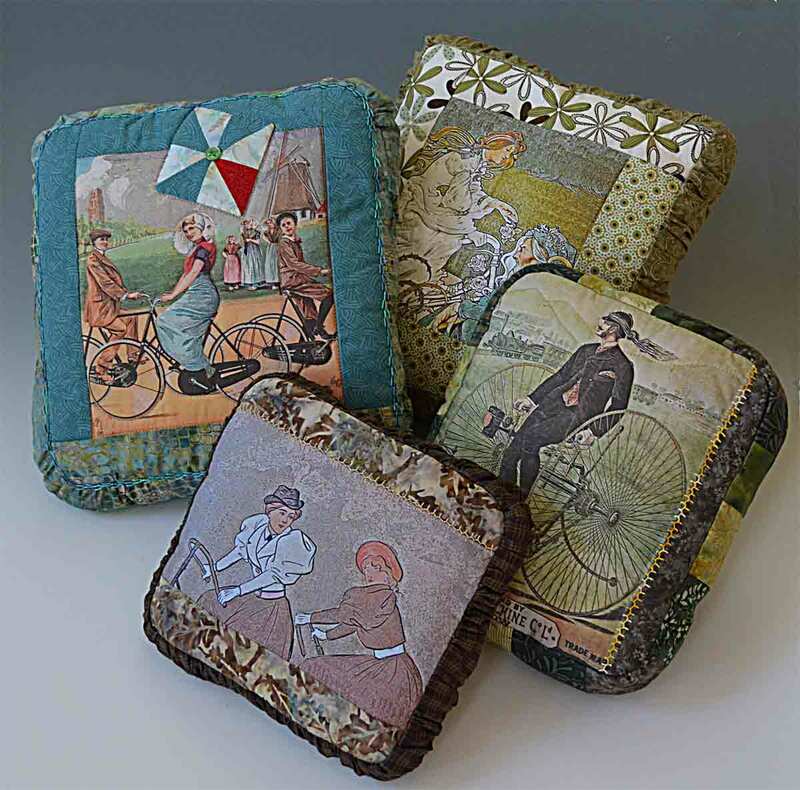 They are appearing again in my quilts, and in these ‘softies’ to commemorate the many pleasures of biking that do not require crashing at high speeds in large groups. All of the cycling images will be in this year’s Studio Tour, and all are for sale, too! My favorite posters from the 1890’s have images of women, but there are some good ones with men, too. The triangles are a traditional ‘wild goose chase’ pattern. Another vintage poster, adapted for silk paints, with a silk-screened image designed by Rita Bascobert for Criterium in the 1980’s. 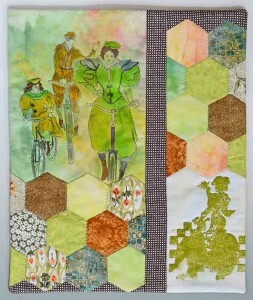 I like the waving back and forth in the two images, joined together by hexagons hand-pieced using paper templates. The image transfers are a new process for me. I find that enjoy them most when combined with traditional piecing. The grouped hexagons are most often part of a ‘Grandmother’s Garden’ overall pattern. For this quilt, they may represent cobblestones or just the refraction of light on a sunny day at the parade. Put a Little Quilt in Your Life! I am enjoying the challenge of making smaller quilts that have all the best features of quilts as we think of them. 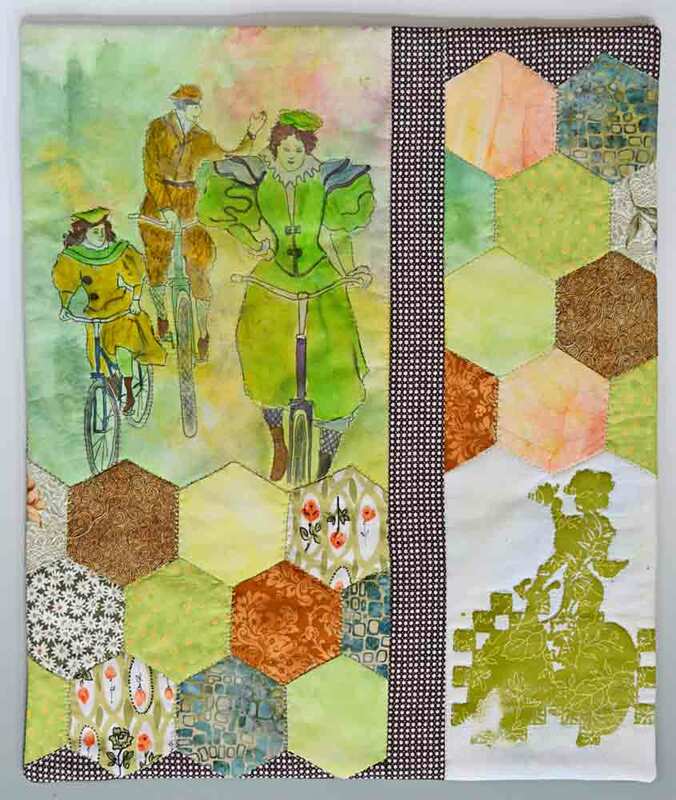 GOOD MEMORIES form one role of traditional quilts, through theme, design, and fabric choice. TEXTURE comes from piecing, quilting stitches, and embroidery. LAYERS of construction add different levels of interest. JOY from the happy combinations of colors from fabric, thread, and paint. 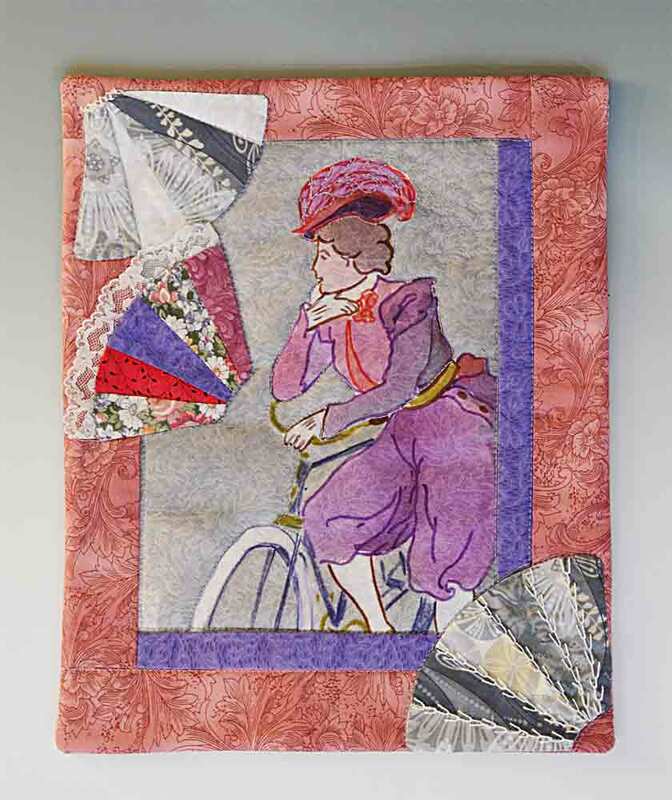 ‘Great-Grandmother Had a Lot of Fans’ is about 13 inches tall, uses the Grandmother’s Fan design and a silk painting to celebrate the feminine side of cycling. 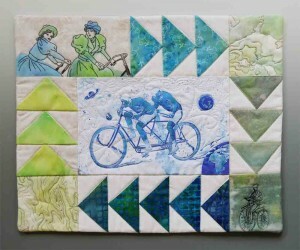 Posted in Bicycling | Comments Off on Put a Little Quilt in Your Life! 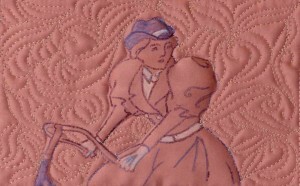 Bicycle advertisements from 1890 through the 1950’s often featured the elegant feeling of gliding through the air. 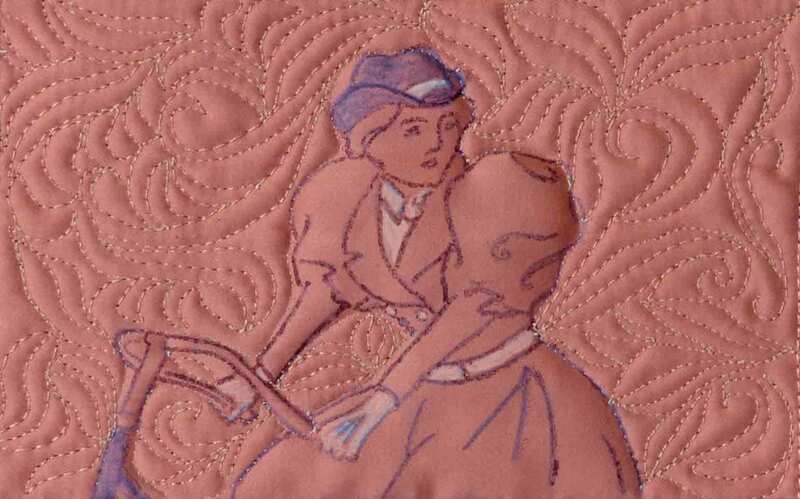 I have been using images from classic bicycle posters in a series of small quilts to celebrate the ‘scorching scandal and emancipation’ that bicycling created for women in the United States. The first big bicycle boom in the 1890’s created the pneumatic tire and a demand for paved roads, as well as women’s voting rights in 1920. This detail is from the ‘Cobblestones’ quilt which uses lots of little squares. 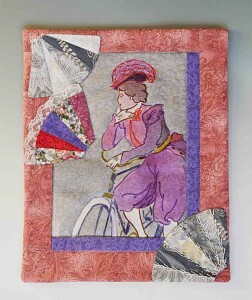 It has been fun to match traditional quilting patchwork with the vintage poster images.